Home / NPFL / NPFL MATCH DAY 3 PREVIEW: COULD KWARA UNITED AND RANGERS INTERNATIONAL BE HEADING FOR THREE STRAIGHT DEFEAT THIS WEEKEND? 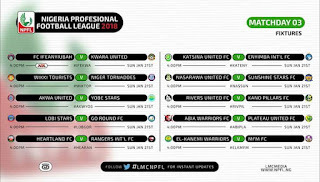 NPFL MATCH DAY 3 PREVIEW: COULD KWARA UNITED AND RANGERS INTERNATIONAL BE HEADING FOR THREE STRAIGHT DEFEAT THIS WEEKEND? Rangers International of Enugu will be visiting Heartland FC of Owerri in the NPFL match day three encounter and this will be another test of competence for coach Gbenga Ogunbote. The have previously lost to Akwa United and Lobi Stars this season. Plateau United will have to prove a point when the visit Umuahia to engage Abia Warriors. They came to win the league for the first time in 2017 and have maintained a 100% winning statistics I'm their previous two games in the 2018 NPFL season. They will be playing without their star winger, Peter Eneji who is currently away on national duty in Morocco and all eyes will be on their new signing Tosin Omoyele if he gets a place this weekend in the first team. FC Ifeanyi Uba will be hosting the newly promoted Kwara United in a match that will be televised live on the network of the NTA on Sunday 21st of January 2018. 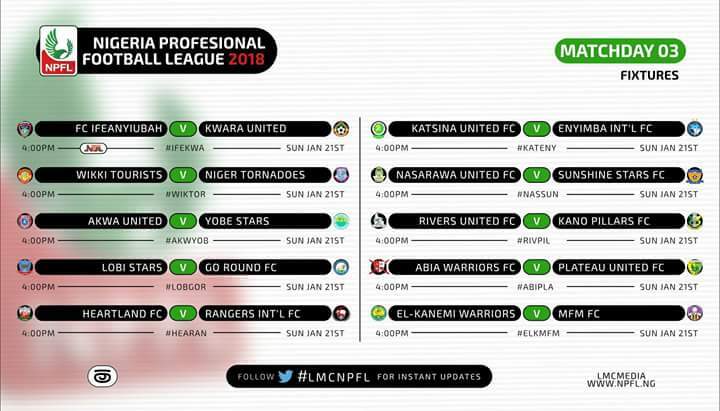 Kwara United may also be heading for their third loss of the season at FC Ifeanyi Uba because the home team will be trying to secure their second win of the NPFL season in front of their home supporters. Both team have a prolific strikers notable among them is Godwin Obaje of FC Ifeanyi Uba who already has two goals in two games. MFM FC will be travelling away to Maiduguri to play against El Kanemi Warriors. They visited this team on the last day of the 2017 NPFL season and couldn't secure the three maximum points. All attention will be on the MFM team to show the same consistency they showed last season. The El Kanemi Warriors cannot be ranked among title contenders but the can surely spoil the day for a contender.